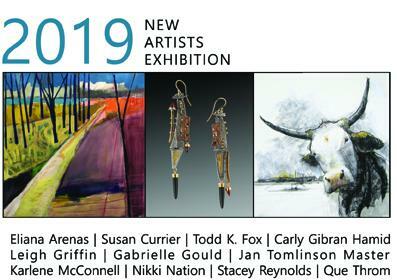 Join us on February 2 between 4 – 7 PM as we celebrate the opening of New Artists Exhibition 2019, a group exhibition featuring artwork by eleven artists who have recently been added to the gallery’s roster. During the reception, light snacks and cocktails will be available alongside live music, featuring smooth jazz by TRio, with Tyler Rosenke on the drums, Ron Gilotti on the bass and Howard Post on the guitar. Eliana Arenas is a North Carolina based jeweler known for her contemporary style and use of nontraditional materials. Metals, garnets, and newspaper are frequently combined in her jewelry designs along with other materials inspired by her immediate surroundings. Her pieces are intricately detailed yet possess a bold simplicity. Her incorporation of collaged newsprint, in select pieces, adds a strong graphic quality to the work. Based in Micco, Susan Currier has worked in a range of media throughout her career as an artist, including photography, painting, drawing, and jewelry design. She is currently exploring her love of free-associative drawing through live sketch and gesture. Susan draws through direct observation in the field and then, returning to her studio, she continues to refine her work. Currier uses a range of materials, such as charcoal, pencil, pastels, and markers, to complete each piece. Her most recent subject matter depicts moments in the lives of domesticated animals. Based in Deland, Carly Gibran Hamid is a ceramicist working in porcelain, a material that she considers both difficult and rewarding. She explains, “I love the texture, brightness, and translucency. I also love how it challenges me to be a better craftsman. I work as thin as possible to accentuate its translucent qualities.” Her sculptural work consists of wall hanging forms that allude to fossilized sea-life, often incorporating repetitive shapes, patterns, and textures. She also creates patterned functional forms, from mugs to vases, with a light airy feel and subtle splashes of color. The work of Leigh Griffin, a jeweler based in Atlanta, Georgia, is strongly rooted in texture. Griffin uses a combination of processes to create her signature look, often layering or fusing different metals together to accentuate their inherent qualities. She also frequently uses a process known as reticulation which melts silver from the surface to produces a wavelike effect. Each piece is then adorned with a range of gemstones to add a splash of color, such as drusy gems, amethysts, sunstones, and moonstones. Based in Denver, Colorado, Nikki Nation’s jewelry is comprised of simple yet elegant forms in gold and silver. She explains that she draws inspiration from the “different properties of her materials, along with design elements, patterns, systems, and repetition.” All of Nation’s jewelry is handmade using traditional methods of metalsmithing such as fabrication, forming, texturing, granulation, and forging. Que Throm is a jeweler based in Orlando. Her jewelry design has been nurtured by her foundation in painting where her use of strong colors, textures, and patterns first emerged. She is inspired by global cultures and frequently uses beads from her travels to places such as India, Thailand, Mexico, and Nepal. She also expresses strong interest in repetitive design. Throm’s extensive background in art history coupled with personal insight gained from her travels has fostered a strong appreciation of traditional adornments that fuels the bold, highly patterned jewelry she creates.